Tell our readers a bit about The Almond Tree, please? In The Almond Tree, I thought I had stepped into the many Palestinians’ shoes I had known and loved over the years in order to tell their narrative, the one that had always haunted me, the one that is little known in the US. 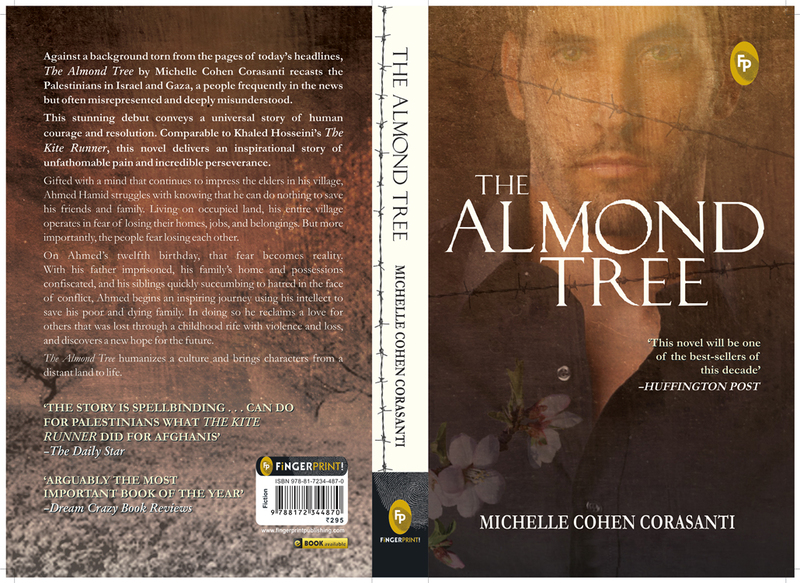 Although I wrote in Palestinian and Israeli voices, one thing remained constant throughout my story, the almond tree. People asked me why I chose The Almond Tree as my novel’s title and frankly, I didn’t know until one brilliant interviewer from The Times of India, Ipshita Mitra asked: what the significance of the almond tree was, why it’s a witness to the atrocities but stands mute and silent, and if silence could ever be an answer to violence. That’s when I realized that I was the almond tree and my story is my refusal to remain silent. 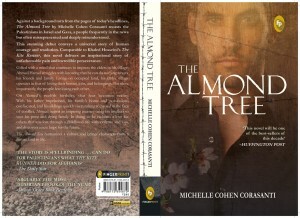 The Almond Tree is part of my story as well. I tried to tell it through the voices of others, but what I was really doing was putting the readers in my shoes to see what I witnessed and learned. For your debut novel, you could have written an easier story. But you chose this one to write. I am so glad you did, but I am also curious, why this? Did any incident(s) trigger this? Some people chose to write because they want to tell stories. I chose to write because I had a story to tell. I didn’t choose my topic. I went to Israel for parental freedom and fun, but became like the witness who saw what she didn’t want to see. You see, I am the almond tree and through my story, I try and make the reader see what I witnessed and learned. The trigger for me writing The Almond Tree was when I read The Kite Runnerwhich caused my past to claw its way out. And there I was, a defining moment, and I decided that I wanted my children to know that I did see injustice and I did try and shine a light. I cried copiously while reading The Almond Tree. You have written it, lived every moment. However much the mind knows it is fiction, the heart refuses to accept. How was it for you to write this story? Was it emotionally draining to write, like it was for me to read? I can’t think of anything in The Almond Tree that isn’t fictionalized reality. It was a relief to write The Almond Tree. I tried to tell everyone what I witnessed and learned when I first returned to the US, but no one cared. The human mind is wired to respond more to personal narratives than facts. When I realized that, I finally felt hopeful that I could help change hearts and minds. It was emotionally draining to relive everything I experienced. When I failed to reach people when I first came home, I’m sorry to say that I tried to bury everything, but I couldn’t. It clawed its way back out when I realized that I could make the reader step into my shoes instead of telling them what I witnessed, I would write in a way that forced the reader to step into my shoes. So on one hand I was completely drained, but on the other, I wanted to remember every detail because I had finally found a way to reach people. The intricacies in the plot are so impressive; one forgets it is a debut novel. I have read that you have nurtured over it for five years. Were you on a mission to tell your story to the world? The story had been inside me for twenty years. I didn’t think I had the perspective to tell the story the way I did when I first came back. I was too emotional. I needed time to digest and recover from what I witnessed and learned in order to write in a way that I could reach my readers. Did you ever want to not write, just give up? Once I realized that I writer can reach into peoples’ hearts and change them, I was going to write The Almond Tree regardless of how long it was going to take. Giving up was not an option for me. How has the Indian market been for The Almond Tree since its South Asian launch? The Indian market has been amazing not only because people are interested in international affairs such as the conflict, but they see many parallels. The Almond Tree is about the Israelis and the Palestinians, but it could be about any people. There are so many universal themes such as the importance of tolerance, education, love, hatred, foreignness, individual vs. community, rural vs. urban, racism, etc… I tried to hit on as many universal themes as possible. How difficult, or easy, was it to get published? In the United States, I think publishers are afraid of this topic. I would like to sell my English rights outside of South Asia to a bigger publisher in the US. Now that I’ve gotten so much positive press, actually a few major US publishers have contacted me. Outside of the US, the rights have been selling at amazing speed. My book wasn’t even out six months and my excellent agent Marina from Pontas had already started to sell world rights. What are you writing about next? I’m completing my next manuscript. It’s from the POV of a Jewish American. When I wrote The Almond Tree, I didn’t want Ahmed to see how flawed she was, but when I began to write from her POV, the story just flowed. What woman can’t see her own flaws? Any pointers for those who nurse the urge to get published but are too scared to take the plunge? If you are not for yourself, who will be for you? What’s the worst thing that can happen? Rejection? The most successful people in life are usually the ones who have experienced the most failures. If you want something in life, you need to go for it with everything you have and not give up until you’ve reached your goal. The Almond Tree goes beyond Ahmed and his family and the almond tree. It goes in depth and makes the author think – like how right is Abbas to wage a war against Israelis and Ahmed not being a rebel despite all the misfortunes his loved ones have been subjected to. Ahmed took the path he did partially out of a moral indebtedness to his father and partially because he had something that could act as a natural bridge, namely, a brilliant scientific and mathematical mind. He had to take care of his family. Their survival depended on him. Ahmed was forced to work for the Israelis as a child to support his family. He had no other choice. He won a math scholarship because he was smarter than his Jewish competition. He won a scholarship to the Hebrew university with a stipend. The year was 1966. He didn’t have the option of going to school in the West Bank because Israel still hadn’t occupied it. In order for him to do so, he’d have to self-deport, abandon his father in prison, his crippled brother and his family. Ahmed was not asked to give anything back to Israel in return for the stipend and scholarship. At the university, in an environment of publish and perish, the Israelis saw his brilliance and embraced him as a colleague. What would he have gained holding on to hatred? In the end, though, Ahmed realizes that in taking care of himself and his immediate family, he left his people behind and he tries to use his stature to shine a light. A crazed Israeli crippled Abbas. He was in chronic pain. He didn’t have Ahmed’s scientific mind. He didn’t have anything that could act like a bridge. He learned Hebrew by working with the Israelis and listening to the radio Ahmed made. He was able to translate for the Palestinian resistance. Ahmed was supporting his family so Abbas didn’t have that obligation. I don’t judge my characters. I just show different ways in which people respond to oppression. There are many factors.